This week we revisit one of our most popular blog posts from 2016– a post from Terry on the metacognitive aspects of skill acquisition (i.e. “learning how we learn”) and how that relates to Total Immersion’s mindful, kaizen approach to swimming. Below, Terry explains the stages through which we all must progress in learning any new skill, and why it’s so critical that the final two stages become an endless loop of skill mastery, as we pursue a deliberate, lifelong path of continuous improvement. Naturally, this approach applies to mastering any skill in life, so it’s not surprising that this article struck a chord with so many readers! Enjoy… and Happy Laps! According to this model, we generally start out with a blind spot: “We don’t know what we don’t know.” We must recognize our deficit to progress further. Next, we must consciously acquire the skill, then consciously use it. By doing so, we gradually acquire the ability to use the skill somewhat automatically. 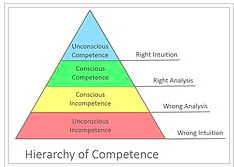 Unconscious Incompetence We fail to recognize that a higher skill level exists or that it has value. You may have escaped this stage quite early in your swimming experience. I didn’t do so for 25 years, until almost age 40. Until then, I believed my swimming potential was limited by a lack of ‘genetic’ traits. That notion was dramatically dispelled—in less than 10 minutes–when Bill Boomer taught me a balance drill, and I recognized I had a serious blind spot in my knowledge of technique… even after coaching with great success for nearly 20 years! Conscious Incompetence Like most TI swimmers, the first skill deficit I identified was balance. For 25 years, I’d thought I had ‘heavy’ legs and the only solution was to kick harder. When Boomer taught me to align my head and spine and shift weight forward, I was stunned at how my legs automatically—and effortlessly—lifted to the surface. That remains my single most transformative moment in 50 years of swimming. Conscious Competence For the next six months I thought of almost nothing but maintaining a straight line between head and hips, and leaning on my chest (a technique called Press Your Buoy which we taught until the late ‘90s), fearful that—after 25 years of unbalanced swimming—I would lose this magical feeling if I wasn’t explicitly focused on it. Unconscious Competence When I finally trusted that balance had become a moderately-durable habit, I immediately adopted a new skill goal—Swim ‘Taller,’ which I’d learned would reduce drag. This change was just as challenging: For 25 years I’d focused exclusively on pushing water back. Now I had to train myself to ignore the hand pushing back and focus on the one going forward. This amounted to a dramatic change in a pretty fundamental values system of traditional swimming—that I should place a higher value on extending my bodyline, than on pushing water back. The fact that I felt markedly better convinced me. Swimming Taller kept me occupied for several more months—during which I regularly made time to check on head-spine alignment. As soon as Swimming Taller began to feel consistent and more natural, I again chose a new skill focus—Holding My Place. After reaching forward, my focus would be to consciously hold my place with the lead hand—then spear the entering hand past it. This was a more complex and challenging skill that the first two I’d tackled. Fortunately I was prepared—in two ways. If I hadn’t already learned balance, it would have been physically impossible to Hold My Place. As well, when I began to concentrate on aligning head and spine, it was my first experience in trying to hold a single ‘stroke thought’ for an extended period. That was surprisingly hard at first, but got easier over time, as those skills moved into the level of Unconscious Competence. When I tried to Hold My Place, I could feel my hand moving back. I had to learn to resolve the conflict between my intention and what I experienced. Fortunately, I was prepared for this far more demanding level of Conscious Competence, by nine months of prior conscious skill practice. That occurred in 1989. In the 27 years since, I’ve never lacked for a new skill goal to maintain in Conscious Competence, which illustrates a critical distinction between the TI view of the learning stages, from that which is commonly taught. 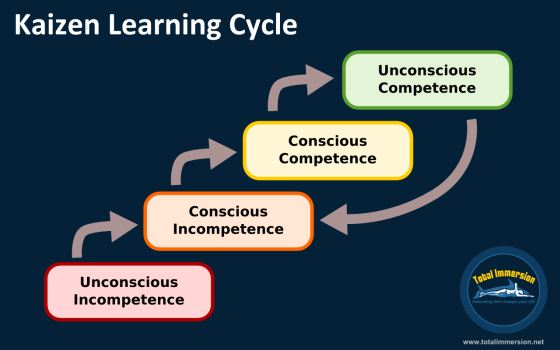 In the kaizen approach to mastery, learning is not a stairstep progression from Unconscious Incompetence, ending in Unconscious Competence, as shown in this illustration. Rather, one’s goal should be to maintain a continual loop of mastery. Upon moving from Conscious to Unconscious Competence in one skill, immediately identify a logical next step. 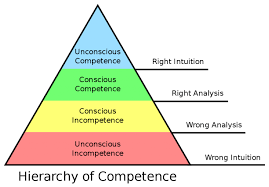 Recognize your Conscious Incompetence at a related, slightly more challenging skill and bring it into Conscious Competence, then work consciously on it until it happens more autonomously. Then start the process all over again, as illustrated here. This process actually involves a change in the physical location in the brain where we process cognitive and motor skill. During the Conscious Competence stage, we process in the cerebral cortex, an area with especially dense neural connections. The cerebral cortex consumes a lot of energy; the same energy—oxygen and glycogen—used by the muscles. When we achieve Unconscious Competence that activity is run by the cerebellum, which uses far less energy. Each time we learn a new skill this way, we not only increase our mechanical efficiency, we also increase our energy efficiency in a surprising way. Learn the skills of Efficient Freestyle with the Total Immersion Effortless Endurance Self Coaching Course!